He has been in a medically induced coma for over a month, but former Formula 1 world champion Michael Schumacher’s sedation is being reduced to start the “waking up process,” his agent said Thursday. Schumacher suffered severe head trauma in a skiing accident at the French Alps resort of Meribel on December 29. The announcement marks a key change to Schumacher’s condition, which has been routinely described as “stable” by agent Sabine Kehm in recent weeks. “Michael’s sedation is being reduced in order to allow the start of the waking up process which may take a long time,” she said in a statement on Thursday. “For the protection of the family, it was originally agreed by the interested parties to communicate this information only once this process was consolidated. Kehm went on to repeat previous requests for the media to respect the privacy of Schumacher’s family. 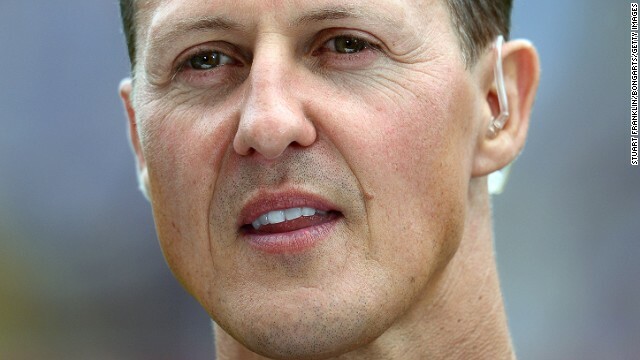 A seven-time world champion whose F1 career ended in 2012, Schumacher has been treated in Grenoble since his accident. Neurosurgeons there operated twice to remove blood clots on the brain and reduce swelling, the reason he has been kept asleep since the surgery. The German has been inundated with support from around the world during his stay, with his former stable Mercedes running the message “Keep Fighting Michael” on its silver livery when they revealed their new car for testing on Monday. The Ferrari team, who Schumacher raced for between 1996 and 2006, also showed their support for their five-time world champion this week in the Spanish city Jerez, where teams are conducting winter testing ahead of the new F1 season. On the eve of the first day of testing, the team’s crew posed with a pit board showing the message “Forza Michael” while the new F14-T scarlet racer made its track debut with the same words of encouragement. Ferrari driver Fernando Alonso told CNN that F1 was “still in shock” over Schumacher’s accident and condition. “The day that I received the news I could not believe it to be honest,” Alonso, who was speaking in Madrid on Wednesday at an exhibition that charts the course of the driver’s career. “We’re all hoping every day to have some good news coming from the hospital,” added Alonso. His investigative team believe the experienced skier hit a rock hidden beneath the snow, while traversing an area between two marked pistes, which catapulted him face first onto another rock. Schumacher ended up 9 meters (30 feet) from the edge of the piste, said prosecutor Patrick Quincy. Footage filmed on a small camera attached to Schumacher’s helmet has been used to help the investigators’ analysis. This entry was posted in SPORTS and tagged coma, doctors, F1, shumacher.